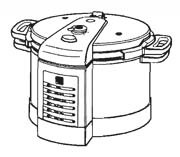 You can find the manual in PDF format on our page for this pressure cooker. Need the pot for my pressure cooker. Parts for these are not available anymore. You may find a used on on eBay, but that would be the only source we know of. My PC 806 pressure cooker is a digital and was only used once with the recipe for sour kraut that was in the book from rivere produce but the teflon started to peel off. I would like to purchase another cooker pot part for my cooker. As well as another manual for it. Revere Ware hasn’t made that one in quite a while. Unfortunately, no replacements are available as far as we know and it is well past its warranty period (which was likely one year at the time).